Each year, the EcoFarm board recognizes three outstanding individuals who have been nominated by EcoFarm’s community of organic farmers and activists. Since the awards began in 1988, recipients have included a veritable who’s who of the movement, with such pioneers as Will Allen, Alice Waters, Wes Jackson, and Vandana Shiva in the ranks. Ferry Plaza farmers Rick and Kristie Knoll of Knoll Farms, Warren Weber of Star Route Farms, Wendy Johnson and Peter Rudnick of Green Gulch Farm, and Jim Cochran of Swanton Berry Farm have also been honored, as has CUESA’s founding executive director, Sibella Kraus. 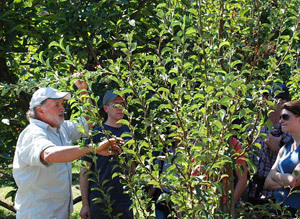 Like many organic farmers of his generation, Rosato started farming during the back-to-the-land movement of the 1970s. As an orchard worker, he pruned trees and picked fruit, just earning enough money to subsist. He made ends meet by gardening at home and putting up his own food. During that time, he also experienced the health impact of farming with pesticides first-hand. He learned what he could about organic farming by visiting other farms, and eventually started his own grafting business. “As a farmer you really need a lot of tricks in your bag,” he says. In 1980, he acquired the land that became Woodleaf Farm, 26 acres nestled in the Sierra foothills near Oroville. “I picked a piece of land that wouldn’t turn into a megafarm, and I wanted stay out of the Valley, even though I knew the soils would be better th ere,” he says. The farm now grows close to 200 varieties of organic fruit, including apples, pears, cherries, and peaches—the farm’s specialty. 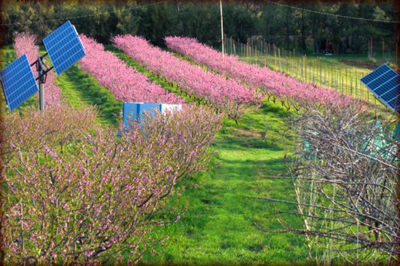 This year marks 30 years of being certified organic, and Rosato is proud to boast that 100 percent of the farm’s electrical needs are met by solar power. Growing fruit in less-than-optimal soil and climate conditions has given Rosato many opportunities to put his organic farming knowledge to the test. He plants cover crops in his orchards and creates habitat for beneficial insects to keep spraying to a minimum. By mowing the perennial grasses and clovers and leaving the green waste, he adds at least four tons of compost per acre. True to the organic philosophy, Rosato doesn’t just grow food—he grows healthy, well-balanced, and lively soil. “When the organisms in the soil are happy, everything is able to do its best,” he says. Rosato’s commitment to organic farming extends beyond Woodleaf through his work as a researcher, soil consultant, and teacher. In 1992, he was awarded a grant from the Organic Farming Research Foundation (OFRF) to study brown rot in peaches, which led to the development of an organic spray that proved to work as well as chemical fungicides. For more than 17 years, he has mentored other farmers, teaching at community colleges as well as on his farm. 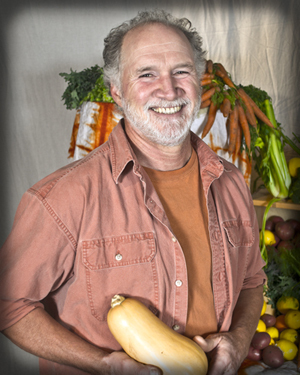 In 2003, he worked with California Certified Organic Farmers (CCOF) to help lead the Going Organic Project, offering mentoring and technical assistance to help conventional farmers in the Central Valley and North Coast transition to organic farming, while demonstrating how organic practices benefit water quality. He has also served on the boards of CCOF and the Community Alliance with Family Farmers (CAFF). This year, EcoFarm also bestowed Susties on the general manager of the Sacramento Natural Foods Co-op, Paul Cultrera, and Cascadian Farm’s Jim and Harlyn Meyer. Dr. Ann López, founder of the Center for Farmworker Families, was honored with a Justie, which recognizes contributions to social justice in sustainable agriculture. Carl Rosato can be found selling Woodleaf Farm’s famous fruit at the Saturday Ferry Plaza Farmers Market July through September. Photos of Carl Rosato and Woodleaf Farm courtesy of Travis Williams/EcoFarm, Carl Rosato, and Barry Jan respectively.